Colonia, Yap – The rest of Micronesia made a clear statement Friday that the road to volleyball gold is going to be a much tougher one in the 2018 Micro Games for the likes of Team Guam. After the men’s team fell to Kiribati in the morning, the ladies were tested by Chuuk in a narrow five-set victory. Guam came out on top 25-17, 19-25, 25-15, 22-25, 11-5 after getting a huge lift from veteran Mary Gillan in the 5th. In the 5th, Gillan scored her first kill in the set for Guam to go up 3-0 early, forcing a Chuuk timeout. Gillan then dropped a big shot down the middle for a 5-2 lead, followed up by a kill down the left sideline that rattled the gym a play later to go up 7-3. Gillan let loose an emphatic shout after the kill that fired her up teammates and the Guam sideline fans. Joie Blas advanced Guam’s lead with a two hand block 11-5 after a short back-and-forth between the teams. Setter Samyra Duenas secured the games final point with an ace from the service line to avoid the brewing upset. 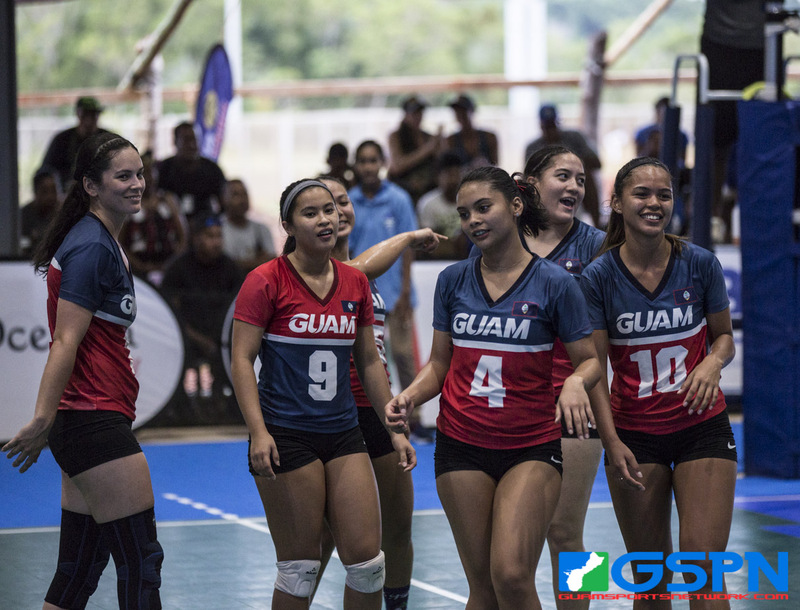 Guam’s ladies looked sharped at times, but more out of sync in the 2nd and 4th sets. Self inflicted Guam errors played a big factor with Chuuk not presenting a big offensive threat. Chuuk’s ball placement and defense presented troubles for Guam as they struggled to pick themselves up when facing a deficit. Guam’s ladies will be taking on Yap in the morning Saturday.